Be sure to look in the built-in ThumbsPlus Help as well! To request we re-send your registration code, please email coderequest@thumbsplus.com. Please include the ThumbsPlus version number, your name, company name (if applicable), address, phone number, and the email address you ordered with so that we can locate you in our customer database. Be sure to follow the instructions in notes about email below. The most efficient and effective way to report problems or crashes in ThumbsPlus, or to request new features, is from within ThumbsPlus itself, since this includes program logs and other information about your ThumbsPlus and system configuration: Help - Submit Problem Report. 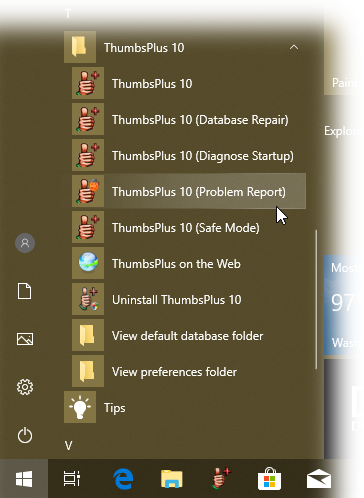 If you're unable to run ThumbsPlus, please use the Windows start menu and select ThumbsPlus 10 - Utilities - ThumbsPlus 10 (Problem Report). At the top of the bug report program, you can use the Configure button to set your email program preference. If ThumbsBug cannot send the mail automatically, just attach the .7z file, which includes logs, preference settings, crash info, and in some cases a screen shot, to an email using your existing email program or web-based email. Be sure the subject line has ThumbsPlus in it, and send it to support@thumbsplus.com. It's easiest for us to help you if you have the latest release. The current ThumbsPlus release is 10 SP2 (build 4015). You may also email us directly at support@thumbsplus.com. Be sure to include information about what you're doing when the problem occurs, any error messages that you receive, and the running version of ThumbsPlus and Windows. Be sure to follow the instructions in notes about email below. Using the ThumbsPlus problem report form usually results in quicker resolution, since it includes information we may need. Please put ThumbsPlus somewhere in the subject of the email to help prevent it being classified by Google Mail or our bug system as spam. Be sure that the return email address is valid, and that you've whitelisted thumbsplus.com with any spam filters on your computer or through your ISP! We can't respond if your spam filter blocks our email.